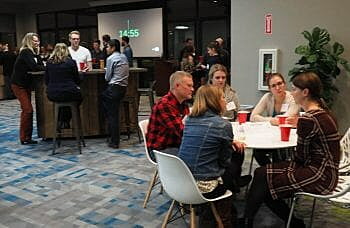 Nearly 60 men and women from Missoula-area tech companies gathered on the third floor of onX’s building earlier this month to discuss diversity and inclusion in the workplace, as well as network with other professionals. onX CEO Laura Orvidas opened the event with a reflection on her own journey and the importance of building strong networks and tackling diversity issues head-on. Participants chose from 10 stations around the room that featured a different topic relating to women in the workplace. For 15 minutes, groups discussed issues such as gender communication, parental leave, and inclusion tactics for brainstorming with men and women. Kym Corwin, ATG director of Production Success & Expert Services, worked closely with Rachael Caldwell, onX Producer – Brand Team, to coordinate the event. Employees from onX, ATG, LumenAd, Partners Creative, ChickTech, LMG Security, Audience Awards, AT&T, Montana High Tech Business Alliance, University of Montana, Submittable, ClassPass, and Women’s Foundation Montana mingled and often continued the discussions that had started at the various stations. Corwin said this was an important event because both men and women actively participated in discussions relating to women in technology, and pointed to a need for future events. “Both men and women need to be part of the conversations in order to make change,” Corwin said. If you are interested in learning more about atgSHE or other ways you can get connected, please contact Kym Corwin (Kymberly.Corwin@atginfo.com) or Rachael Caldwell (Rachael.Caldwell@onxmaps.com). Katy Spence writes for the Montana High Tech Business Alliance.